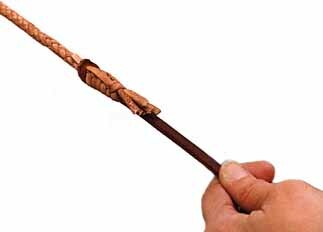 Falls and crackers take the brunt of the wear when a whip is used, and require replacement as needed. The end of the fall wears off, shortening the fall. Depending upon use, a fall worn down to under 12 – 18 inches needs replacing. Leather falls also stretch and thin down, and should be replaced when they have become noticeably thinner than the end of the thong. Red hide falls tend more to hold their thickness but to break off, white hide falls tend to stretch more but break off more slowly, and need watching for getting too thin. In addition, the kangaroo strands adjacent to the fall will in time break because of the sharp flexing at this point. The fall should be replaced as soon as the first strand breaks. 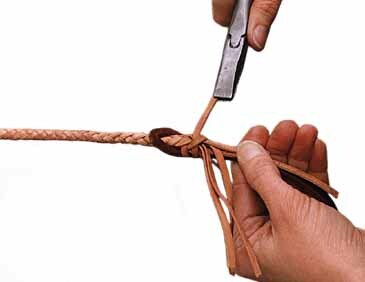 If the braided end of the thong adjacent to the fall has all strands intact, the old fall may be removed without undoing the hitches holding the fall, and a new fall slipped into place. 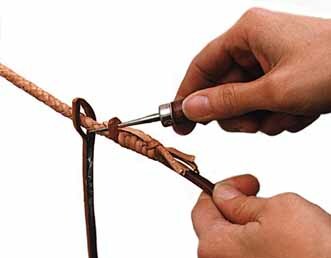 To do this, attach the main body of the whip to a hook or some other secure anchor, then trim the end of the new fall to a point, put the old fall and part of the thong through the eye of the new fall and grease the new fall with braiding soap or Pecard Leather Dressing. To remove the old fall put a fid through the eye of the old fall between the fall and the braid, and using a sharp knife cut the fall against the fid, taking care to avoid cutting the braid. Pull the old fall out of the hitches. Feed the point of the new fall through the tunnel under the hitches where the old fall was removed, and pull into place, holding the end of the last hitch so it may be put under the eye of the new fall as the latter is pulled up. The result should appear as shown to the right. 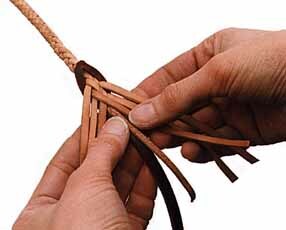 When strands of the braid next to the fall are broken or badly worn the hitches must be undone and part of the thong undone until the shortest strand in the loose ends is about four inches long. Place the end of the thong through the eye of the new fall as shown to the right and grease the strands with braiding soap or Pecard Leather Dressing. With the strand on the left, tie a half-hitch around the fall and other strands in the direction shown and pull tight. With short strands use pliers to pull the strands tight. 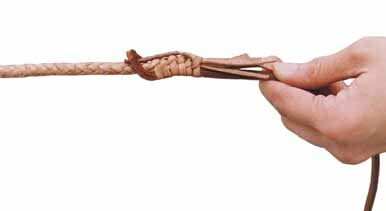 Move the remaining strands to the left, leaving any core strands against the fall, and fold the end of the first strand down and hold it against the fall. 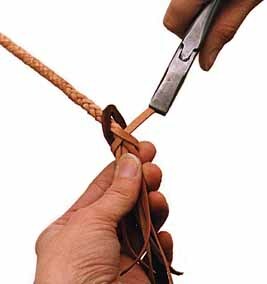 Taking a second strand pull it tight and tie a second half hitch in the same manner as the first. Continue on with the remaining strands of the braid, but after the last strand is hitched put the end of the strand up and under the eye of the fall. Tighten all strands again in sequence from the first to the last, pull the fall securely into place, and then trim the ends of the strands to a uniform length. Lastly roll the attachment between two hard surfaces to make it smooth. braided goods and related information.